**NOTE** This release has been updated with pricing information. Toronto, Ontario. 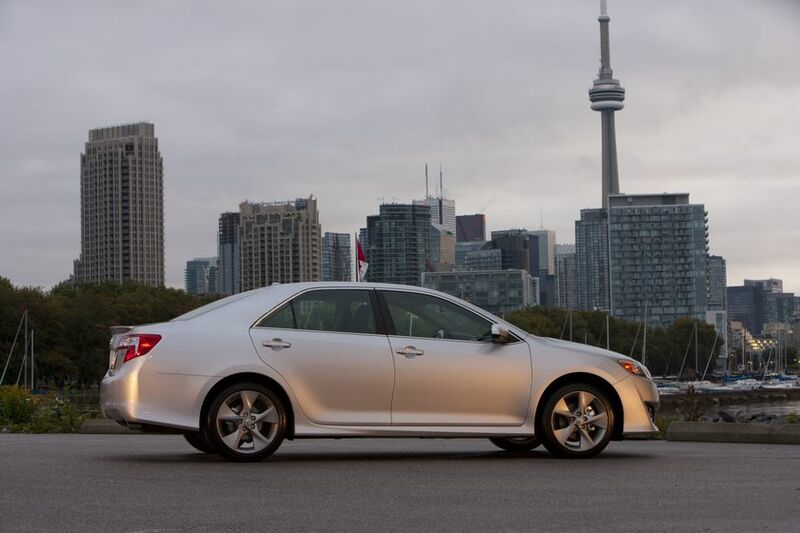 – Toyota introduced today the new, seventh-generation Camry, North America’s best-selling car for nine years running and 13 of the past 14 years. 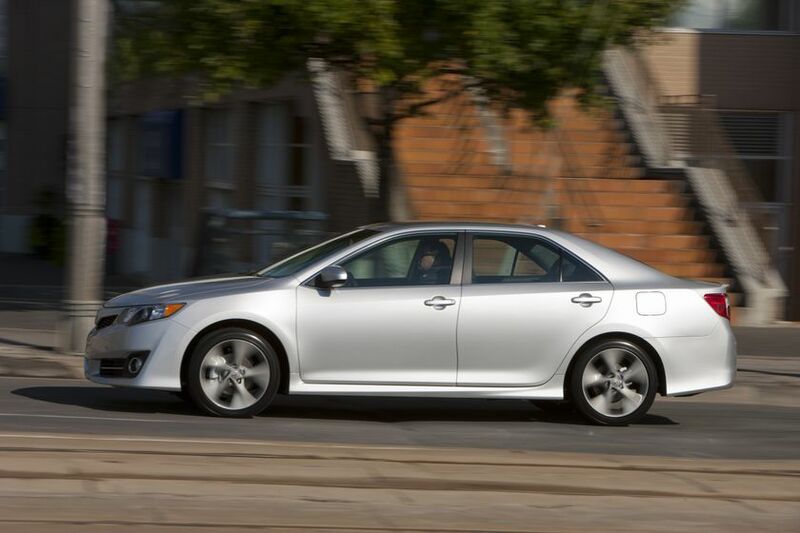 The 2012 Camry debuts a bold, sophisticated new design with a more spacious interior, improved driving dynamics and an even quieter ride than before. 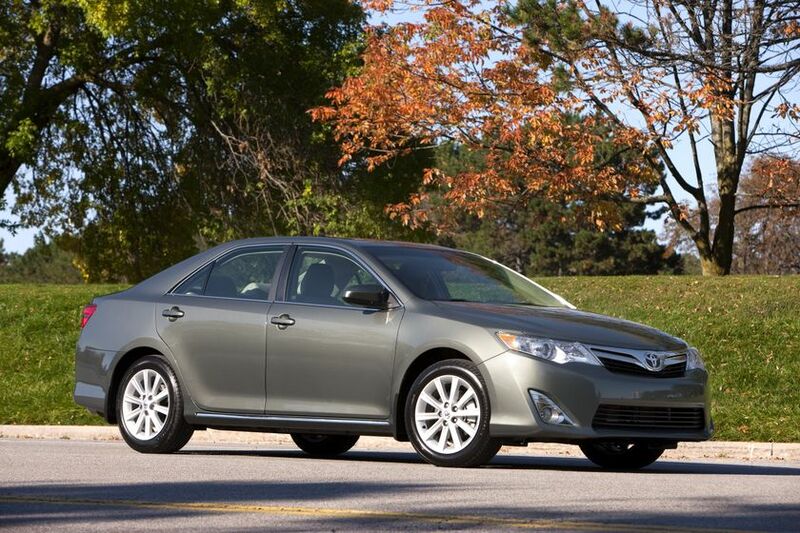 With class leading safety and fuel economy, the end result is the best Camry ever made. 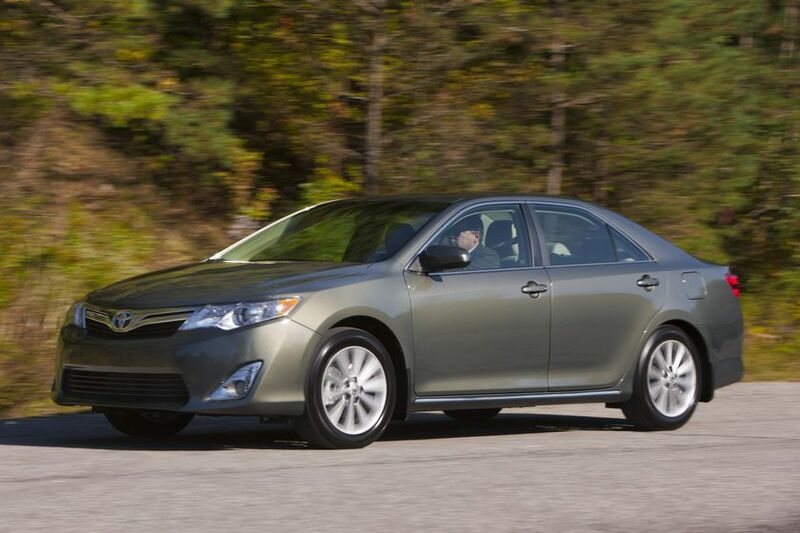 Introduced in 1983, the Toyota Camry would later establish the template for the modern midsize sedan, setting benchmarks for Quality, Dependability and Reliability, along with a comfortable, quiet ride. 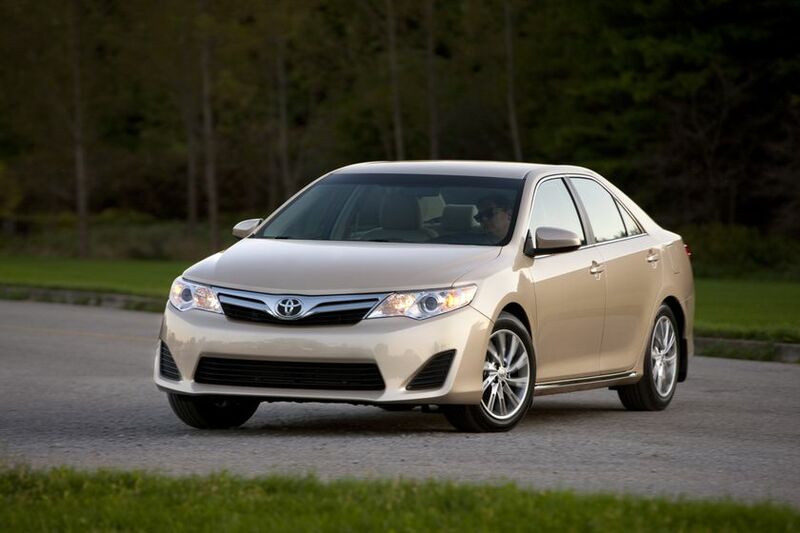 Since that time, Toyota has sold more than 15 million Camry models worldwide. 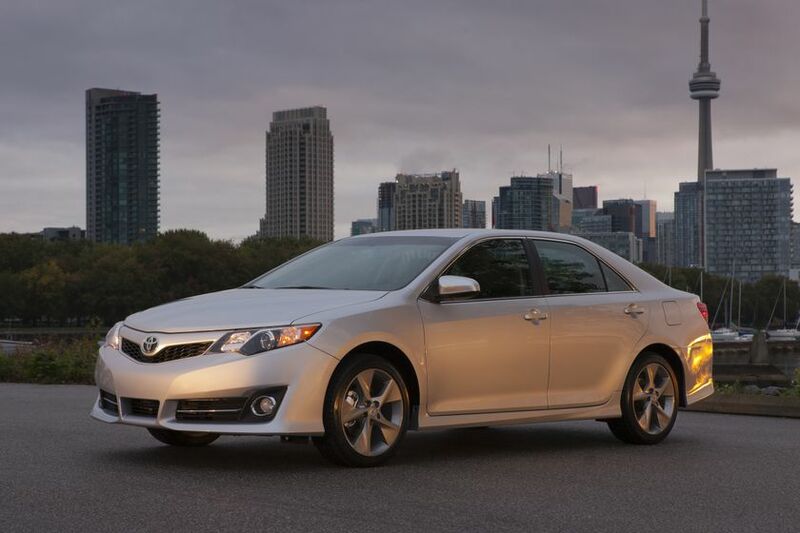 The Toyota Camry again offers three powertrain choices, all of which have been enhanced for 2012 to provide better fuel economy and more responsive performance. 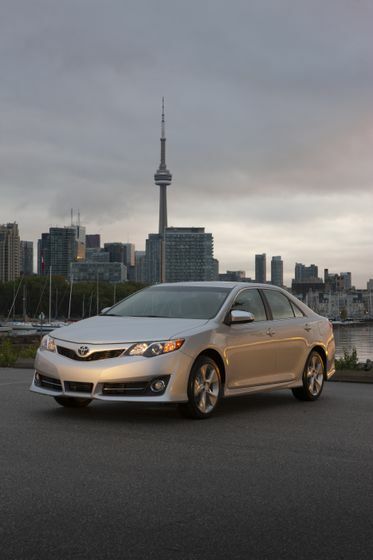 All Camry models with the revised 2.5-litre four-cylinder engine now offer 178 horsepower, and 170 lb.-ft. of peak torque. 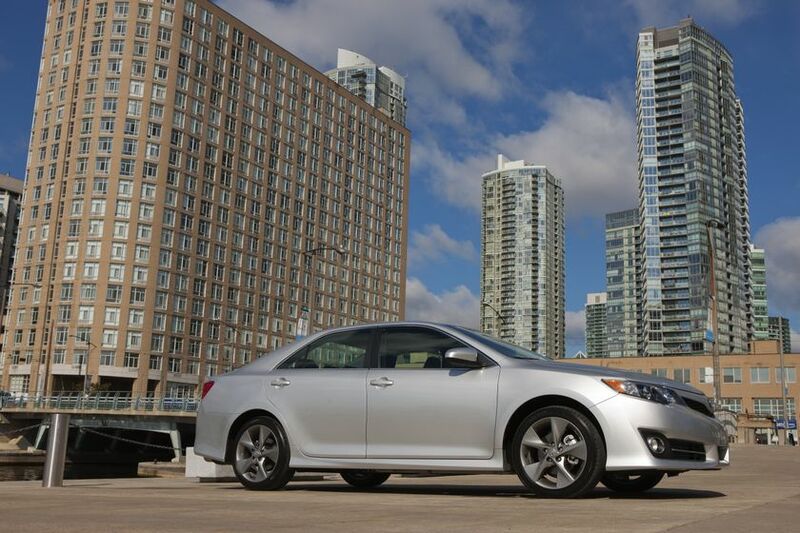 Fuel efficiency numbers are 8.2L/100 km city, 5.6L/100 km highway, and 7L/100 km combined. The 2.5-litre engine employs Dual VVT-i (Dual Variable Valve Timing-intelligent), which controls valve timing on both the intake and exhaust camshafts for optimal performance and efficiency at all engine speeds. The Acoustic Control Induction System (ACIS) helps optimize torque over a broad engine speed range. 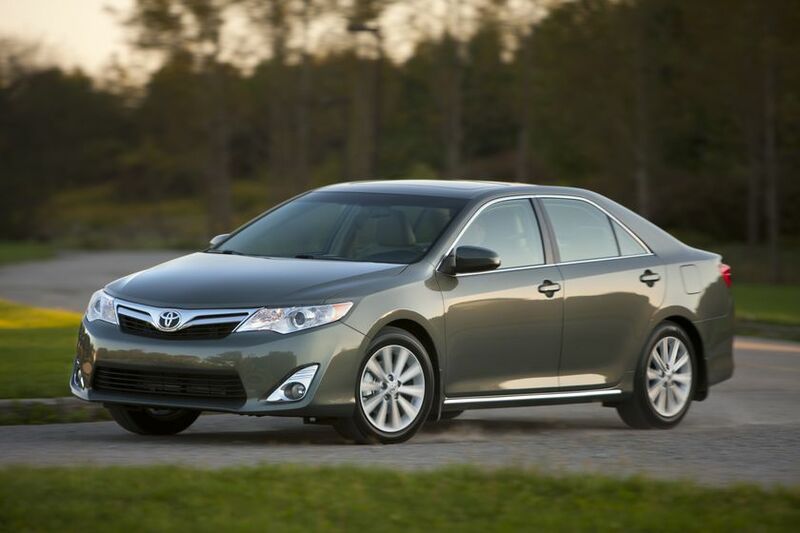 Like all Toyota models, the Camry will feature Toyota’s Star Safety System™ standard, which includes Vehicle Stability Control (VSC), Traction Control (TRAC), Anti-lock Braking System (ABS), Electronic Brake-force Distribution (EBD) and Brake Assist (BA). 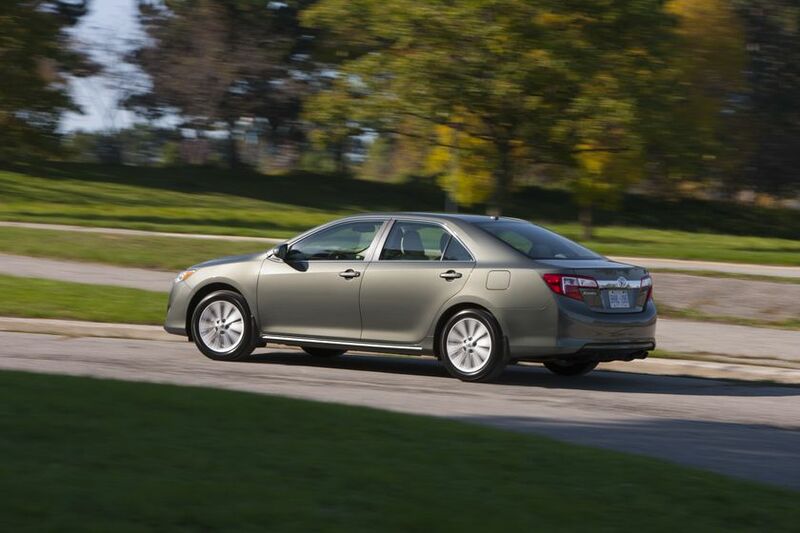 It also features the standard Smart Stop Technology brake-override system. The DOHC 3.5-liter V6, available in the SE and XLE grades, delivers 268 horsepower at 6,200 rpm and 248 lb.-ft. of peak torque at 4,700 rpm. 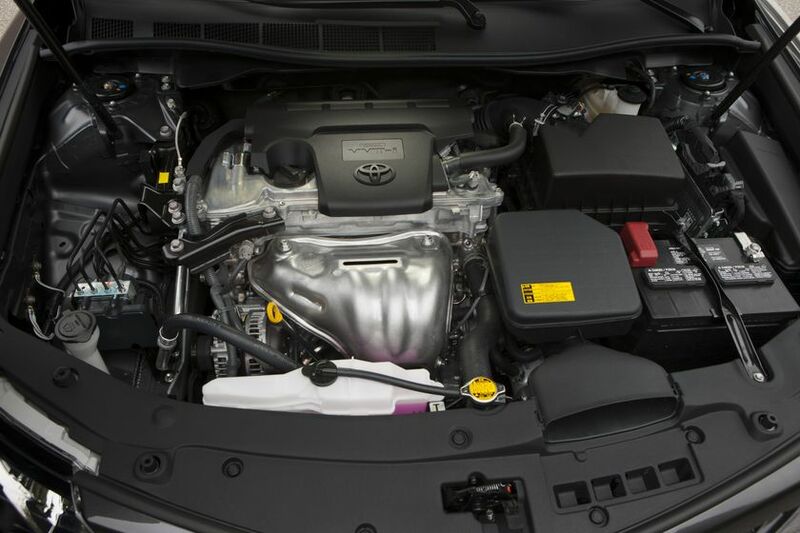 Enhancements to this engine boost its fuel economy to projected fuel efficiency ratings of 9.7 L/100 km city, 6.4L/100 km highway and 8.2L/100km combined the best for any current V6 midsize sedan. 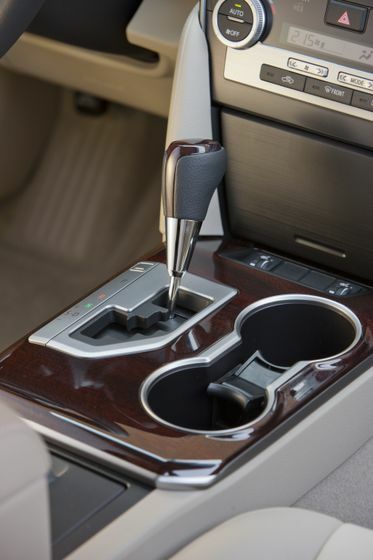 The gas-engine LE, XLE and SE models come equipped exclusively with a six-speed automatic transmission that offers a sequential manual shift mode using the console shifter. Intelligent control adapts shifting strategy in response to driver input, with fast kick-down. 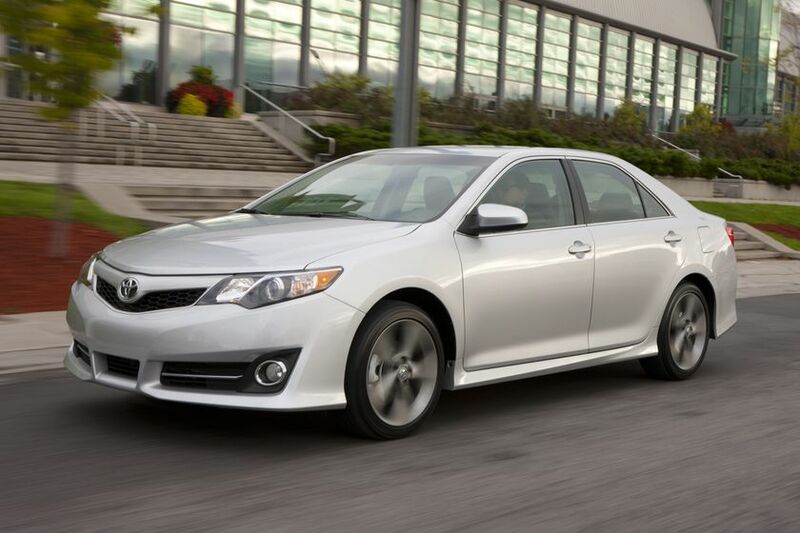 In addition, the Camry SE exclusively offers a “D range” sequential shifting, which allows manual shifting with the new steering wheel paddle shifters even when the console shifter is in the “D” mode. 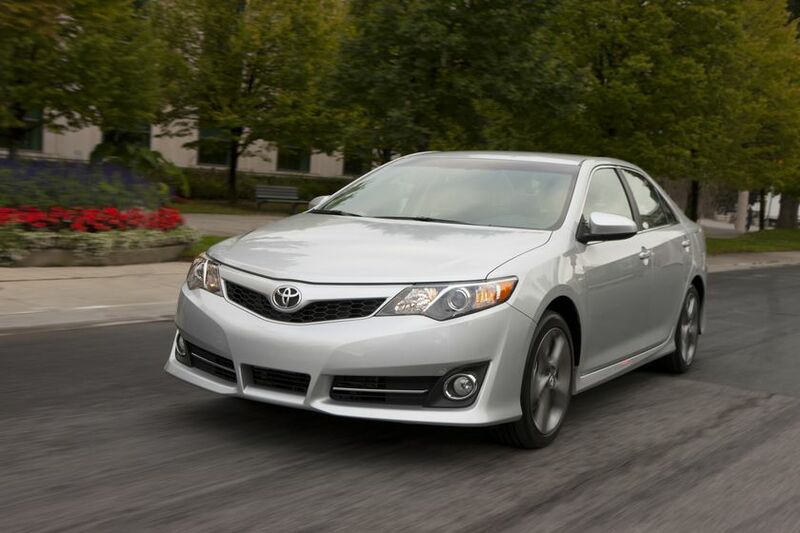 Also exclusive to the Camry SE, the automatic transmission features faster shift times when in “S” mode and downshift blipping control emphasizes a sense of sportiness. 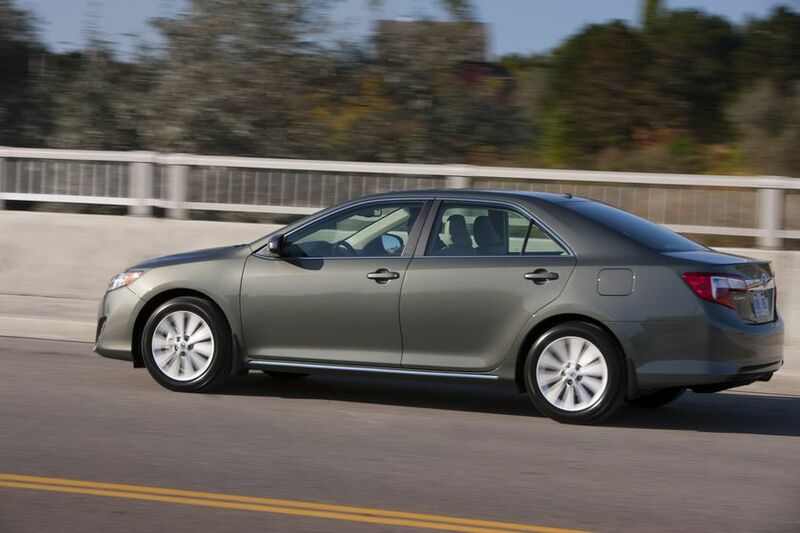 The new Camry Hybrid debuts a highly revised version of the brand’s Hybrid Synergy Drive powertrain, including a new 2.5-liter four-cylinder engine. Through its unique transaxle, the Hybrid Synergy Drive system combines output from the four-cylinder engine with a small high-torque electric motor. The system produces a combined 200 horsepower and varies power between the gas engine and electric motor, or combines both, as needed. The new 2.5-liter engine, like the 2.4-liter it replaces, uses the Atkinson cycle (delayed intake-valve closing for an expansion ratio greater than compression ratio) to achieve maximum efficiency. 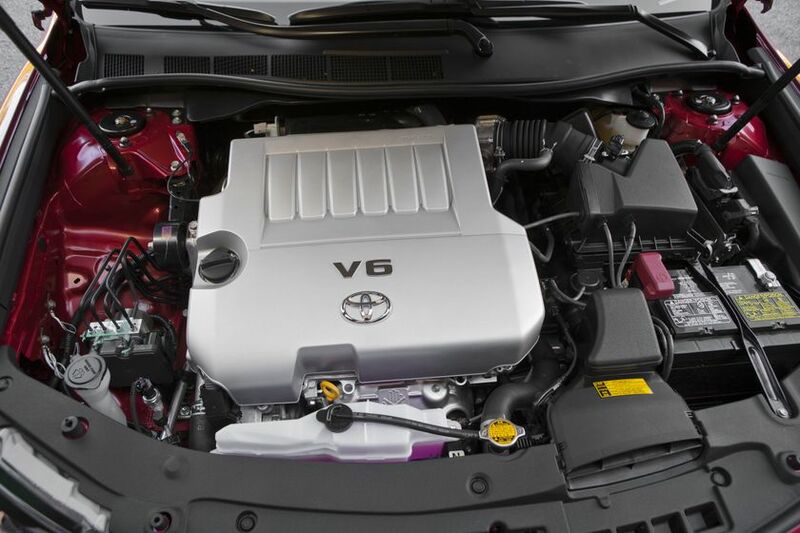 The Variable Valve Timing with intelligence (VVT-i) system on the intake camshaft enhances torque, which is greater than with the previous engine. An electric water pump, a roller-rocker type valvetrain and a variable-output oil pump help to reduce internal friction, boosting efficiency. A new water-cooled exhaust gas recirculation (EGR) system helps to ensure the lowest possible emissions at all vehicle speeds and helps increase fuel efficiency. By cooling and controlling exhaust gas injected into each cylinder, the system eliminates the need to richen the air-fuel mixture to control cylinder temperatures. 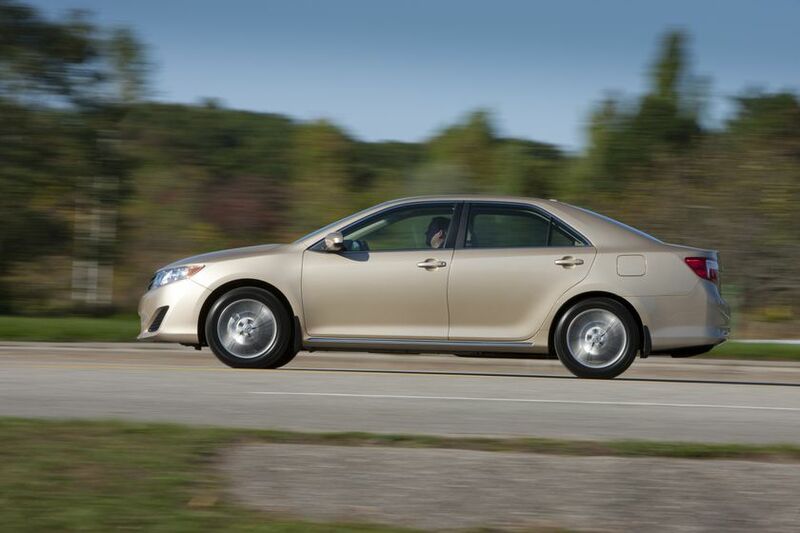 The 2012 Camry Hybrid meets Tier 2 Bin 3 emission standards. 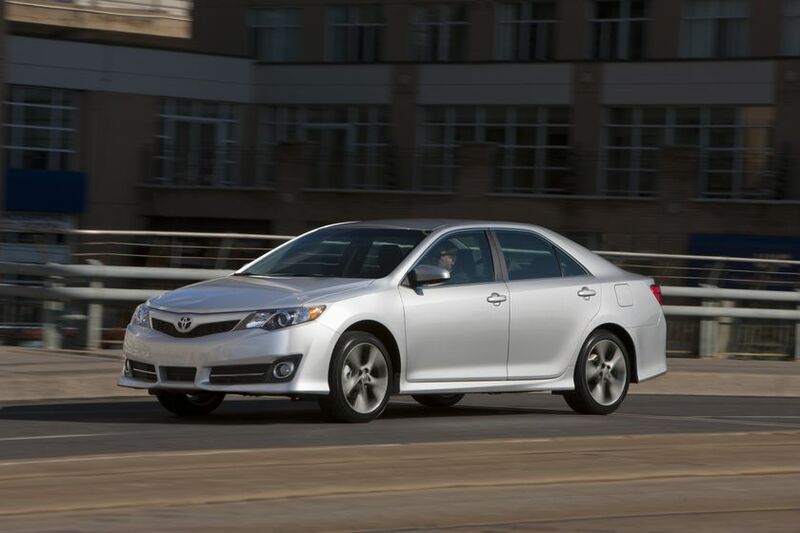 New sound absorbing materials in the engine compartment, along with more linear control over engine speed, give the 2012 Camry Hybrid a more pleasing sound under acceleration. 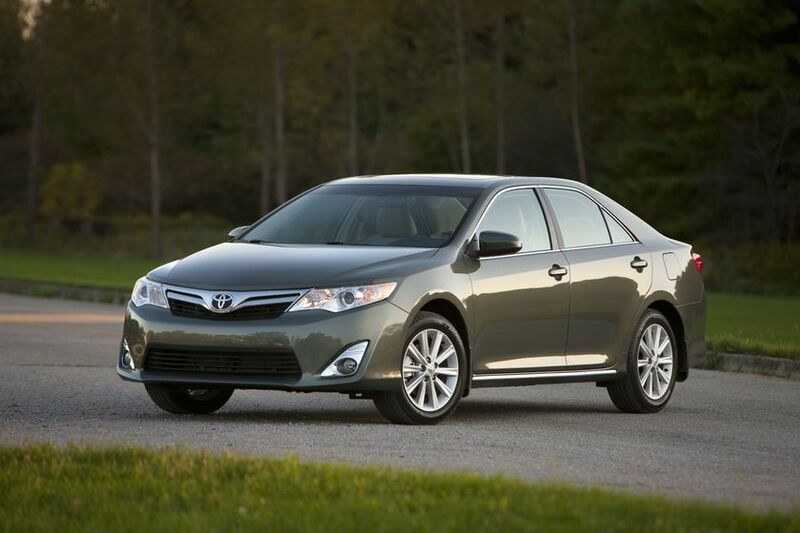 Because there are situations in which the gas engine in the Camry Hybrid shuts off and in order to maintain accessory power, air conditioning and power steering systems are driven electrically. New efficiency measures in the Hybrid Synergy Drive system include reducing internal losses in the transaxle, improving motor-voltage control, and optimizing the regenerative braking. The proven nickel-metal-hydride battery, located in the luggage compartment behind the rear seats, now features enhanced air-cooling. 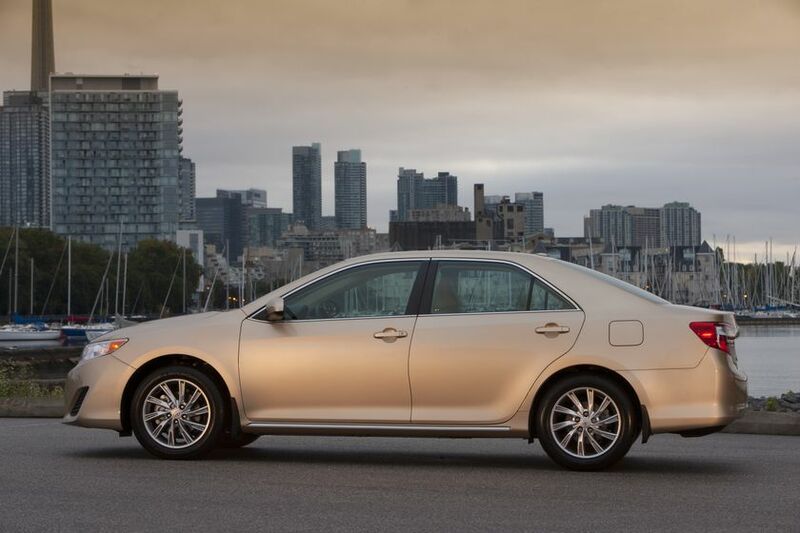 Its more compact size, along with moving the DC/DC converter to the engine compartment, results in a larger trunk than in the previous-generation Camry Hybrid. 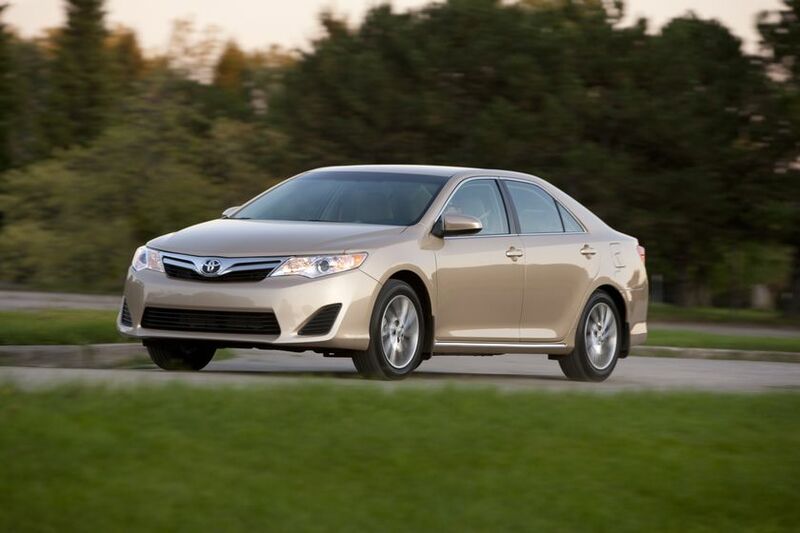 Lighter overall vehicle weight also contributes to better performance and fuel efficiency. 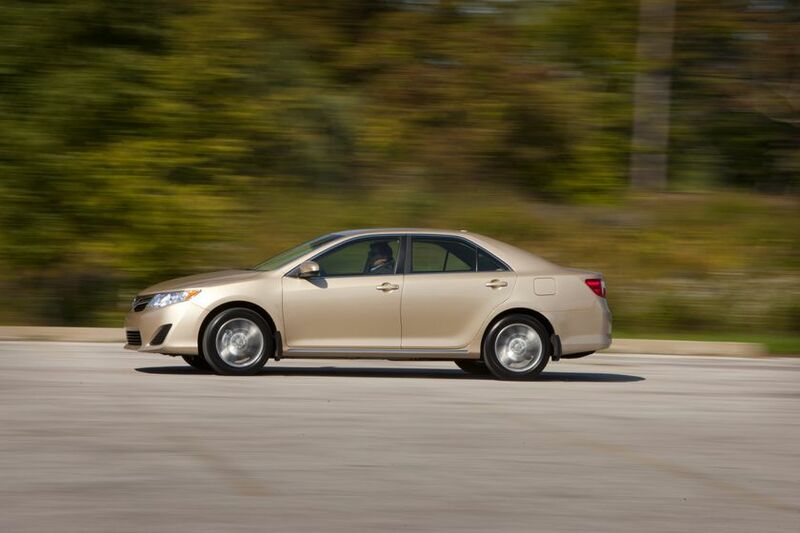 Lower rolling resistance tires, available on the Camry for the first time in 17-inch size, also help reduce fuel consumption. 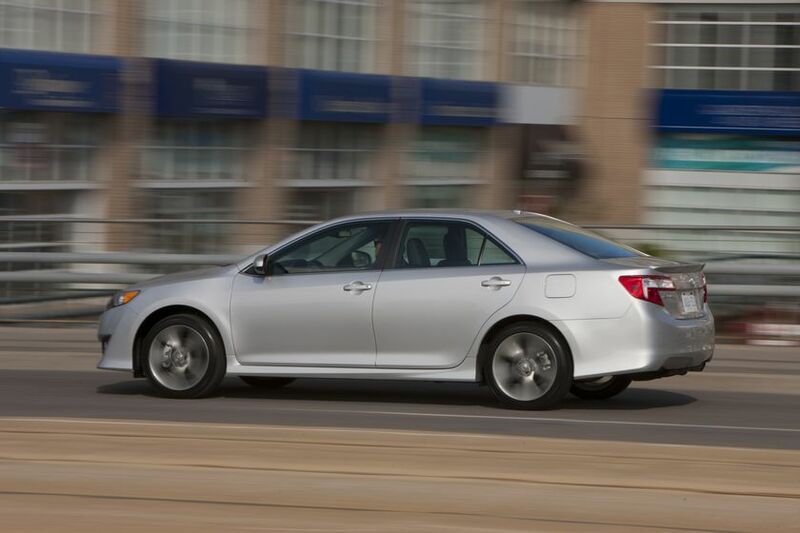 New for the 2012 Camry Hybrid, an EV Drive mode allows the driver to operate the car on the electric motor alone for up to 2.5 kilometres at lower speeds (below approximately 40 km/h). The EV indicator illuminates when the vehicle is being propelled solely by the electric motor. 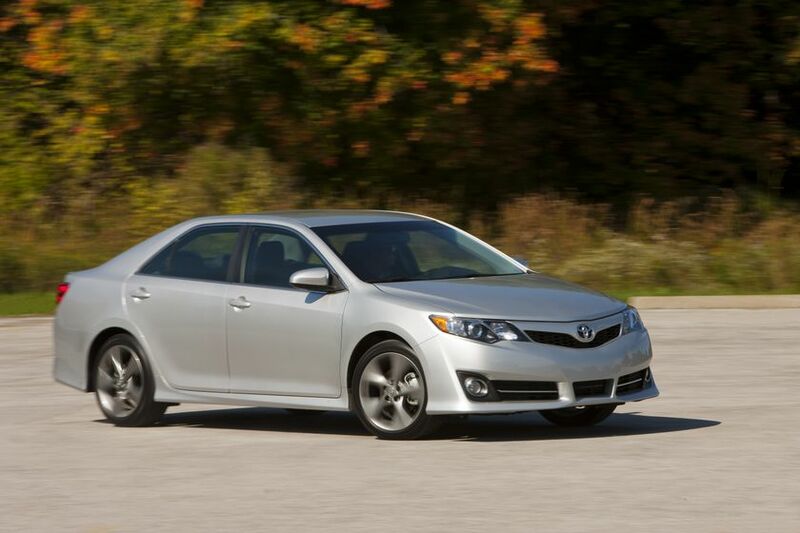 As on the previous Camry Hybrid, ECO mode optimizes throttle response and air conditioning output to prioritize maximum fuel efficiency. 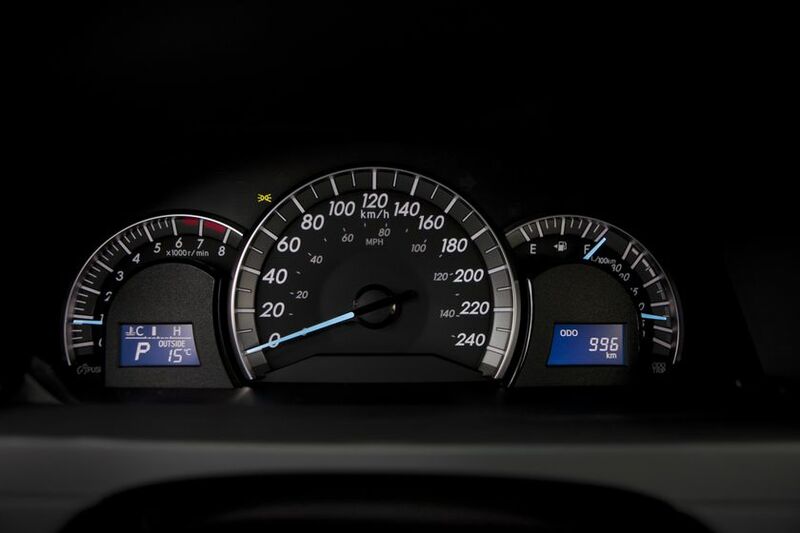 A Hybrid-exclusive instrument cluster with Hybrid System Indicator and fuel consumption indicator helps the driver to operate the car as economically as possible. Instantaneous fuel consumption is shown with LEDs (light emitting diodes) around the outside of the average fuel consumption gauge. The car’s Multi-Information display graphically shows fuel consumption in real time and can also show energy flow, and cruising range information. 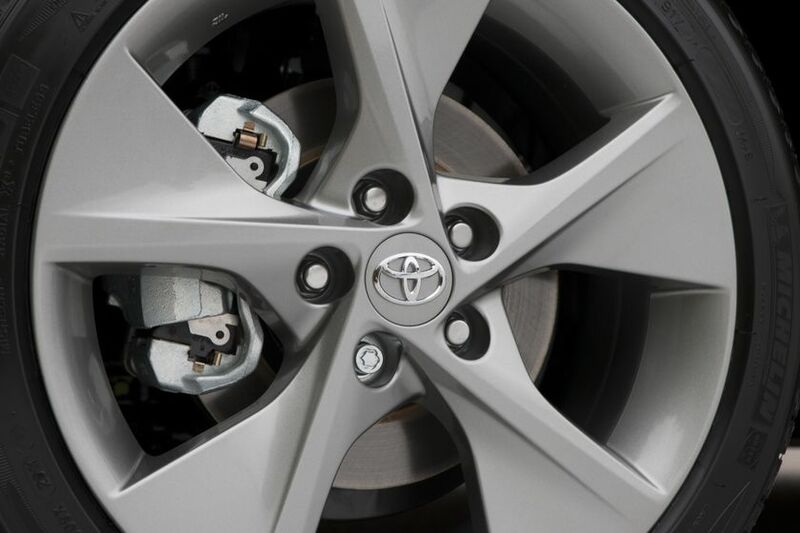 As before, applying the brake converts the motor to a generator that captures the kinetic energy from the still-spinning vehicle wheels, storing it in the hybrid battery pack. 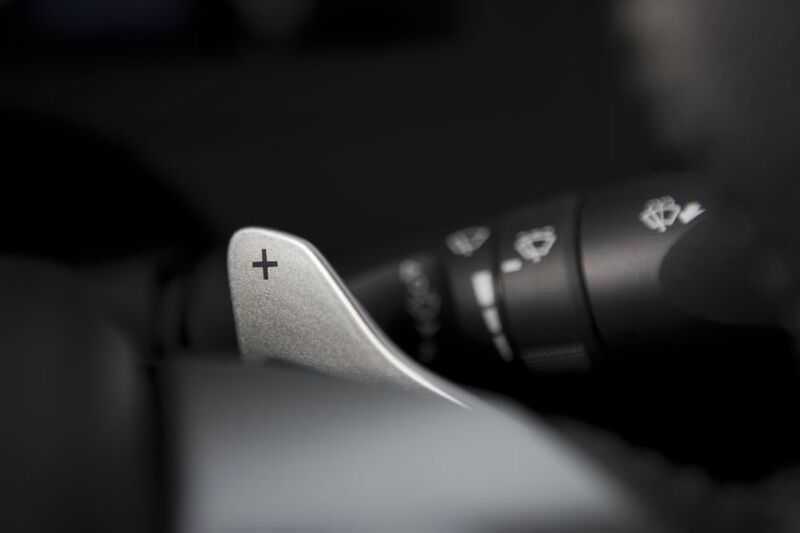 Putting the shifter into “B” uses regenerative braking as a form of engine braking for enhanced control on steep descents. 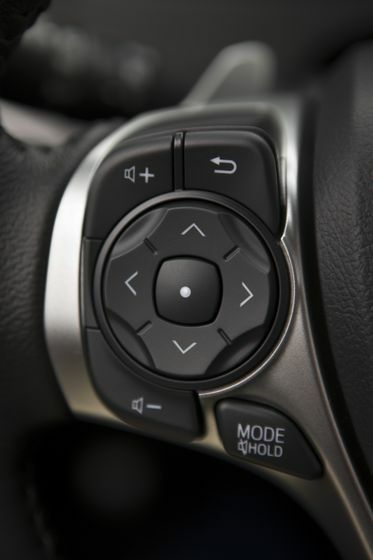 New hill-start assist control helps prevent the vehicle from rolling backward when starting off on an incline when the brake pedal is released. 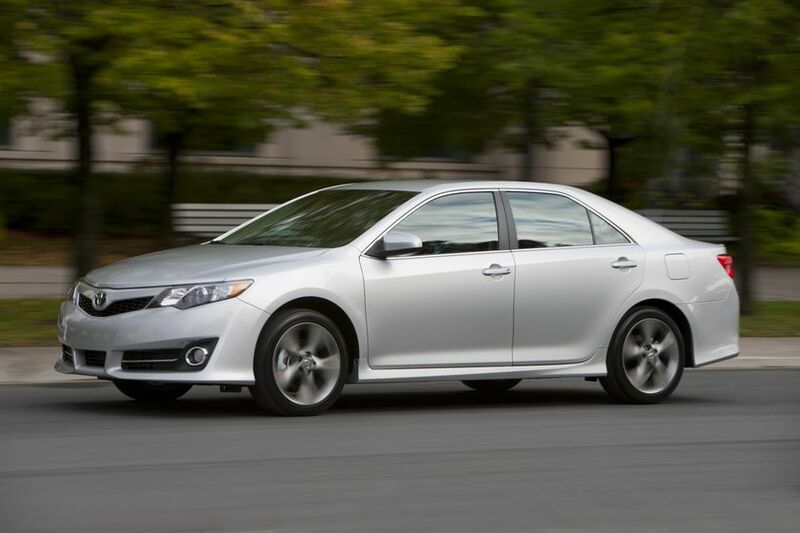 Exclusive exterior and interior design touches and badging differentiate the 2012 Camry Hybrid from other Camry models. 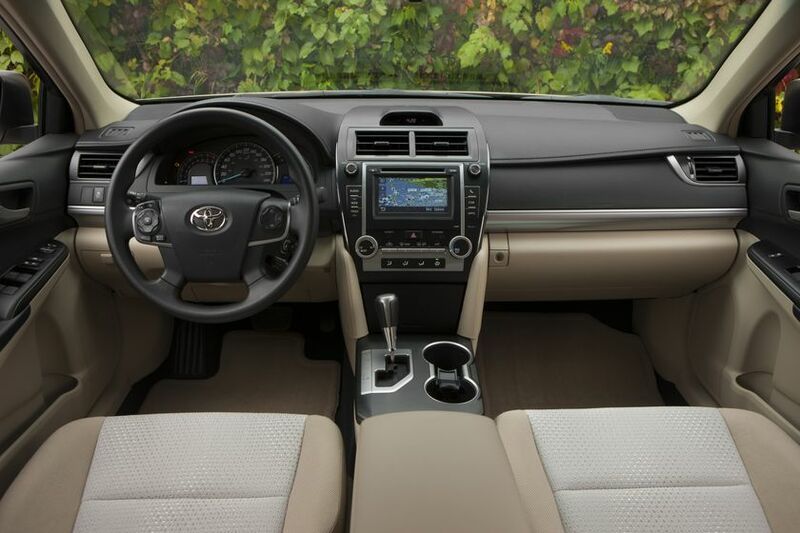 Inside, Hybrid-exclusive trim is found on the instrument panel and door switch bases, upper console panels and shift knob. 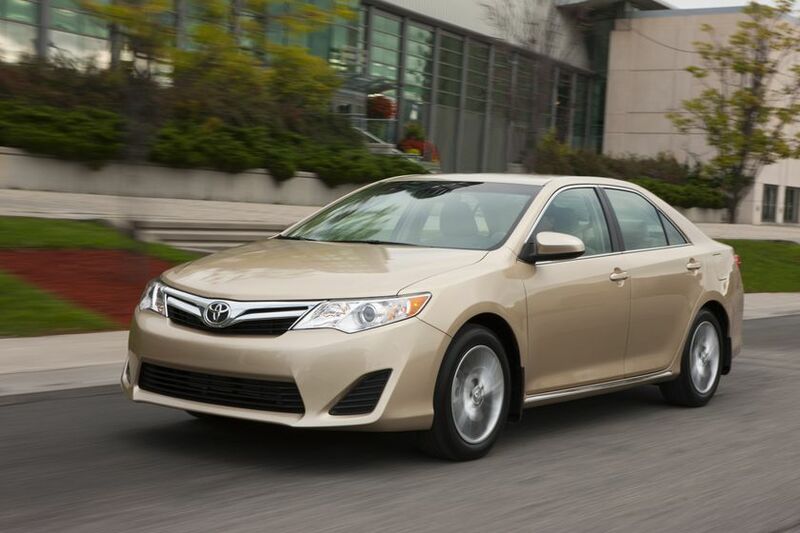 The Camry Hybrid also features its own exclusive seat fabric in ivory or ash. A three-dial Optitron gauge panel with chrome-accented outer rings provides a luxurious appearance. 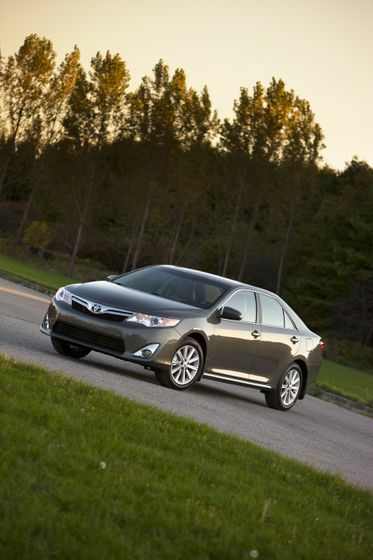 The new Camry and Camry Hybrid will offer seven different model grades to choose from. 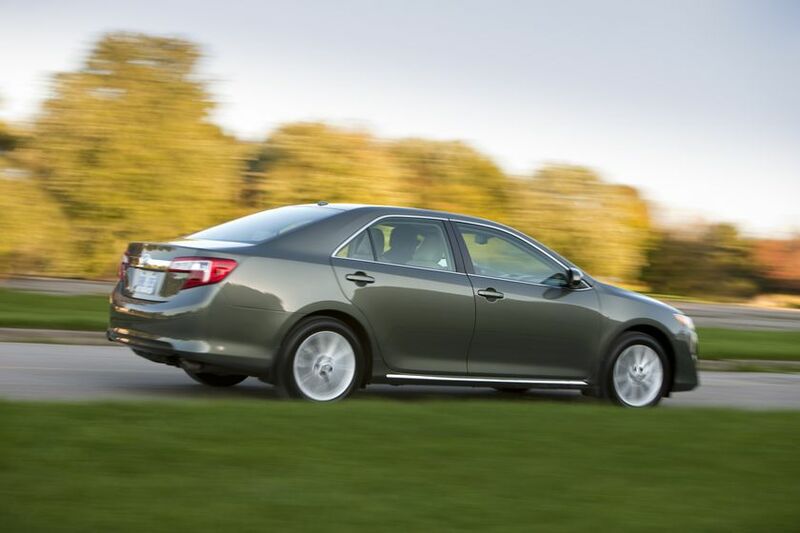 The value-driven LE, premium XLE and sporty SE grades. 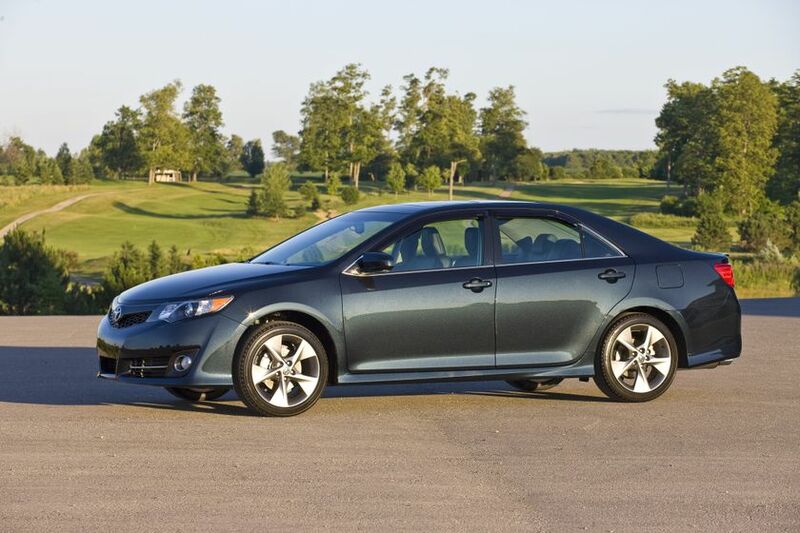 The XLE and SE are available with four-cylinder or V6 engines. 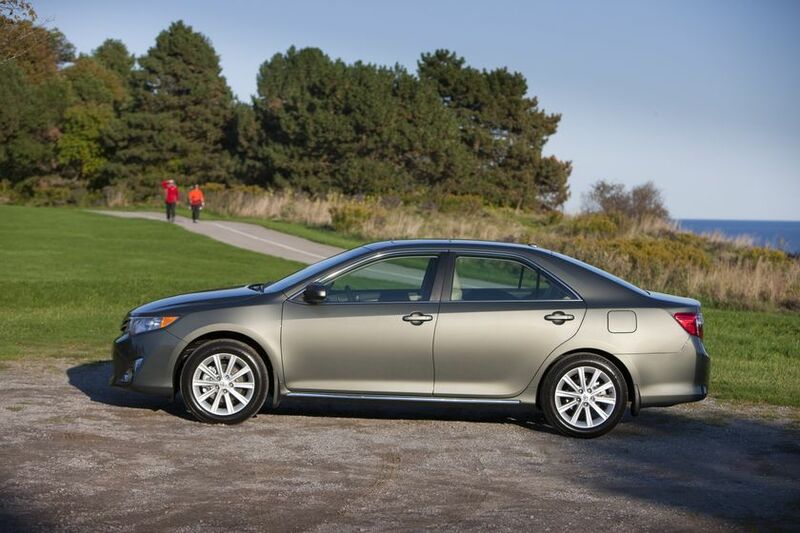 The Camry Hybrid is offered in LE and XLE grades. 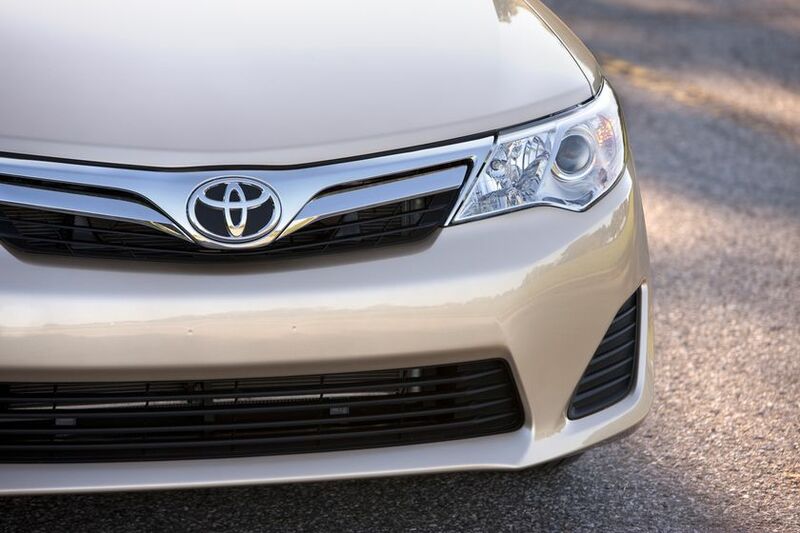 The Camry LE and XLE feature additional exterior chrome trim, and the SE grade debuts its own lower-body design and exclusive fine-mesh upper grille section. 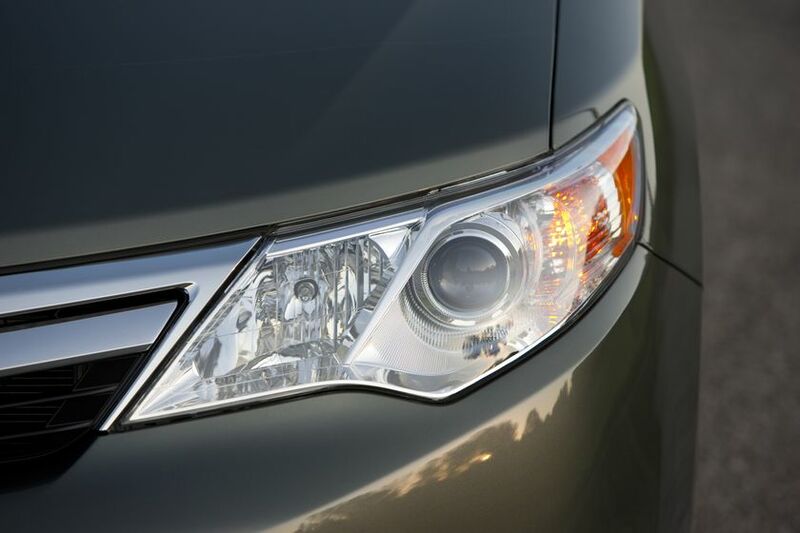 The SE also features three-part lower grille section housing fog lamps, along with black sport trim headlamp bezels. 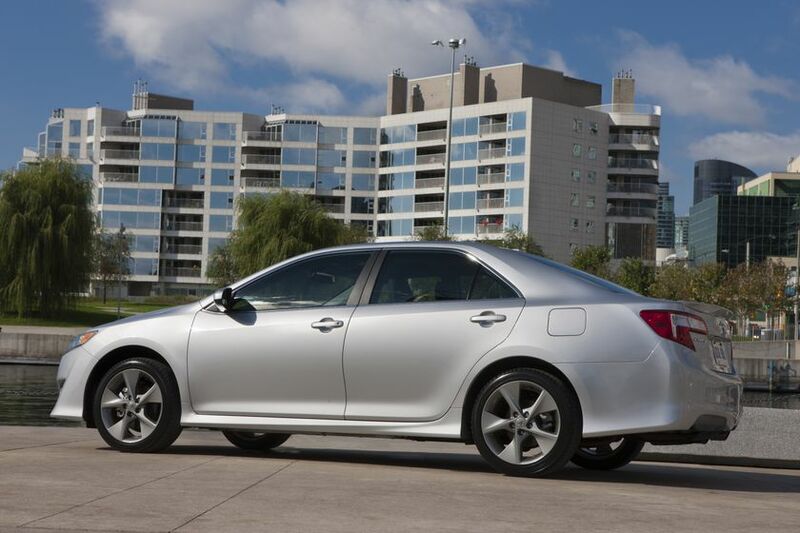 The more prominent rocker panel mouldings on the SE cleanly link to integrated front and rear underbody spoilers, emphasizing width, and the trunk lid carries an integrated spoiler. Accentuating the new body design are four new colors. 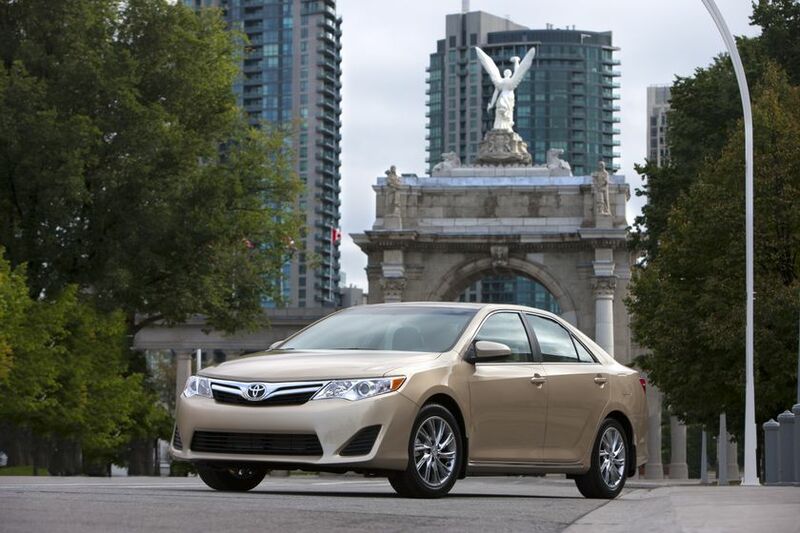 Two of the colors (Attitude Black Metallic and True Blue Metallic) are all-new to Toyota in Canada. Attitude Black Metallic blends in a bright blue pigment for an intriguing take on traditional jet black; True Blue Metallic incorporates a silver metallic pigment to lend this hue a glassy, water-like finish. 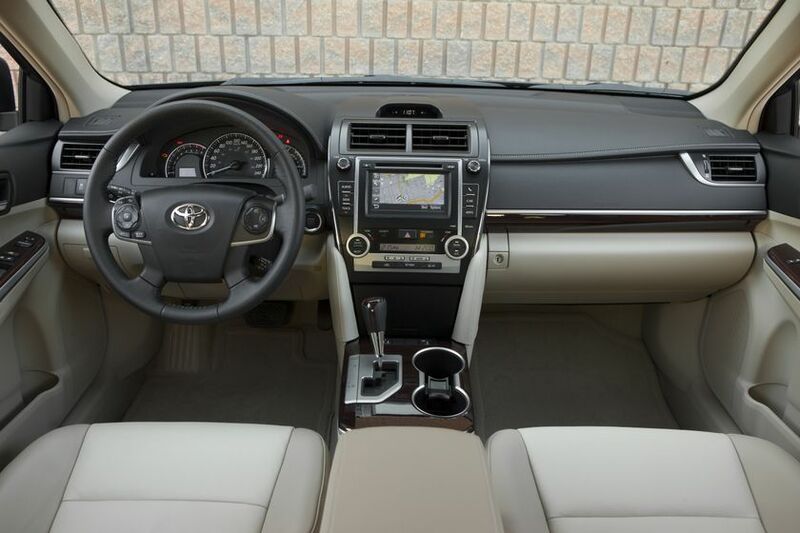 While featuring nearly the same external dimensions as the previous generation, the 2012 Camry offers a more inviting and spacious interior. A new dashboard design, modified seat locations, redesigned seats and “lean” door, pillar and headliner trim all combine to add both real space and greater perceptual spaciousness while also enhancing outward visibility. 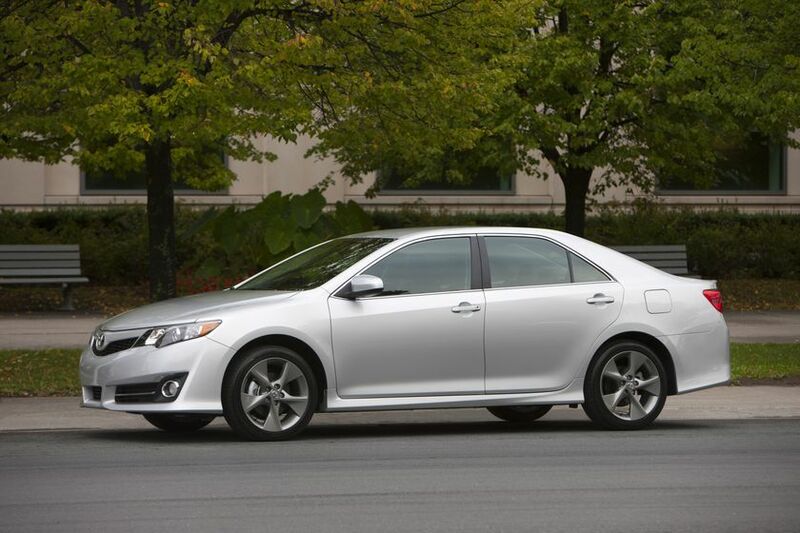 The Camry LE and XLE grades feature either ivory or gray seating color; the Camry SE features unique upholstery in black-on-black. Newly designed front-seat frames, higher seatbacks and longer seat cushions enhance comfort. The height adjustment on the driver’s seat offers nearly a half inch greater range than before (total travel is 2.4 inches). The SE’s sporty front seats provide thicker side bolsters, and the exclusive three-spoke leather-wrapped steering wheel offers paddle-shift control for the six-speed automatic transmission. 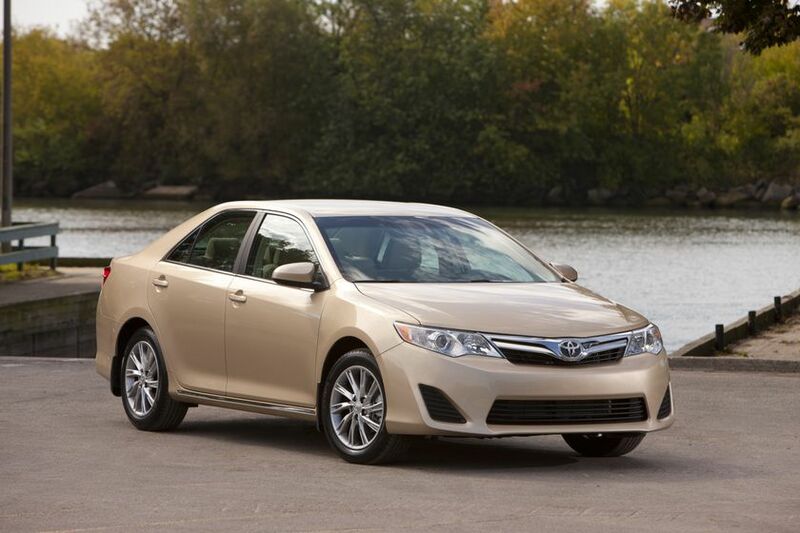 For 2012, the Camry offers four seat-covering materials from fabric to leather, and more. 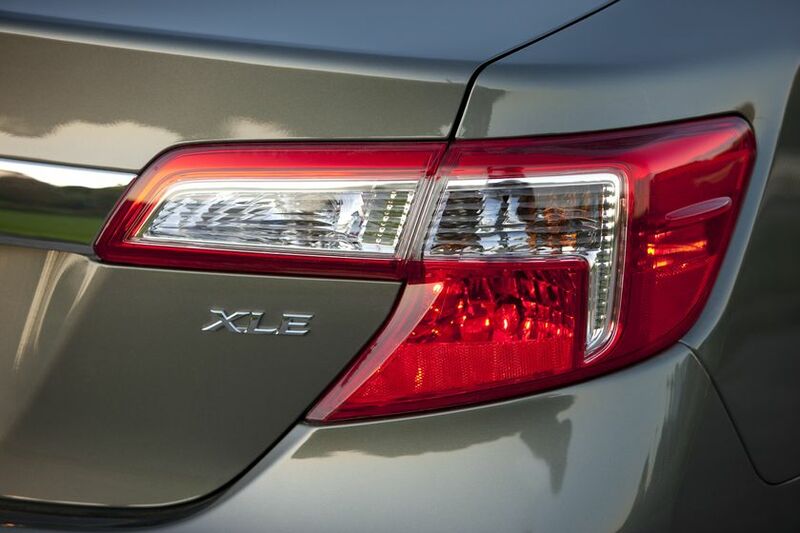 Heated seats are standard on the XLE four-cylinder and XLE V6 models and are available for SE and XLE Hybrid with variable temperature control. 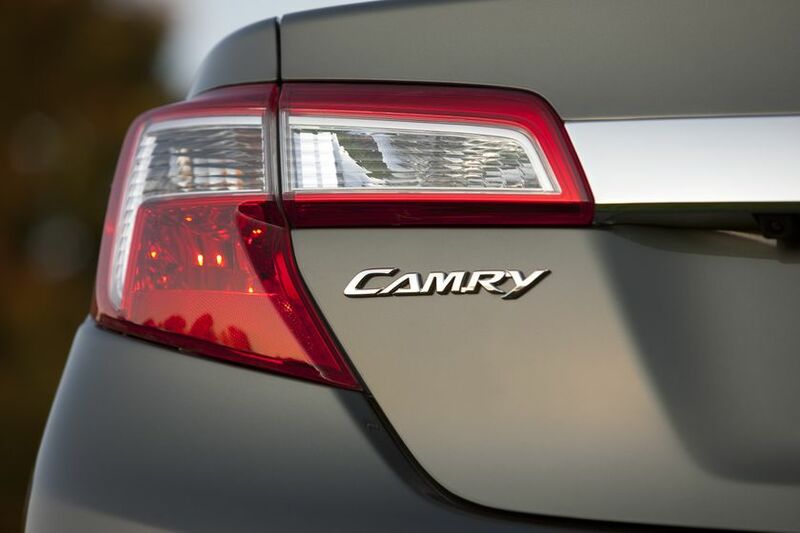 The new Camry gas provides the added functionality demanded by consumers today, yet keeps its controls straightforward and intuitive to use. Control knobs impart a high-precision feel when used. 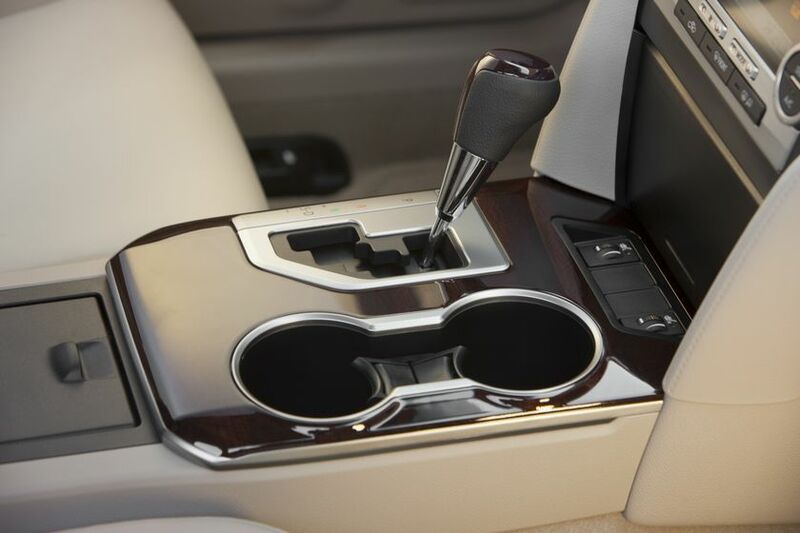 Special attention was paid to function and comfort with the center console design. Soft kneepads on both sides add comfort for the driver and passenger; the front section offers a 12V accessory connector and an easy-to-access USB/input jack port for connecting iPods and other media devices. 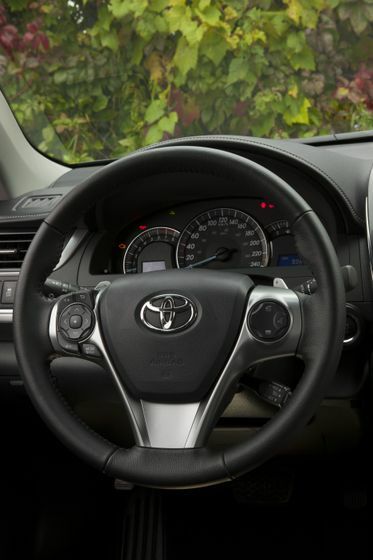 Two steering wheel designs, with integrated audio and Bluetooth® controls, are featured: a four-spoke for LE; a leather-wrapped four-spoke for XLE; and a sporty three-spoke, leather-wrapped wheel for the SE. 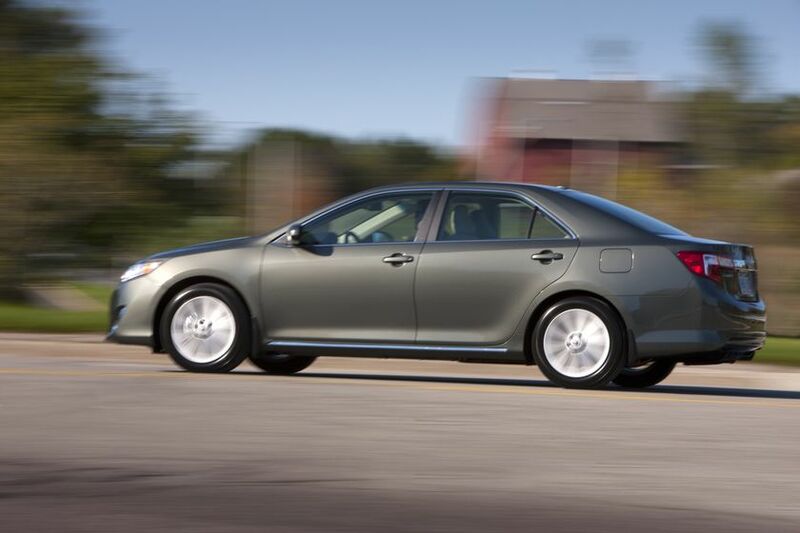 Seamlessly integrated into the Camry gas models are state-of-the-art electronics and enhanced connectivity features. A Bluetooth wireless connection for compatible hands-free phone calls is standard, now improved by an available automatic phone book transfer function. 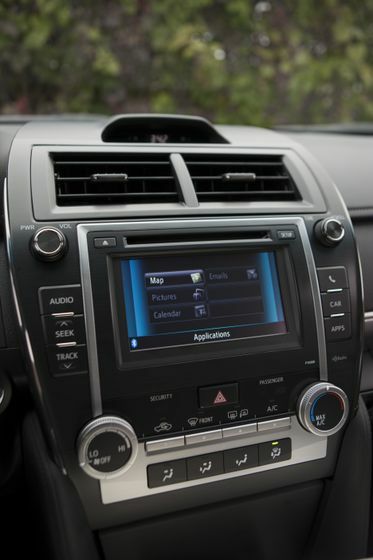 Also standard is a USB port that allows playing of music and video from portable audio devices, using the vehicle sound system and available in-dash display screen, including full iPod integration. The standard audio system on LE, XLE and SE has a 6.1-inch screen and six speakers. 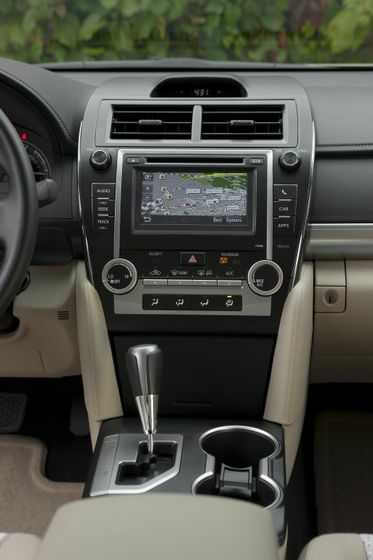 The screen also displays the energy monitor and fuel consumption data, and functions as the monitor for the available integrated back-up camera (SE and XLE only) and the Display Audio System. 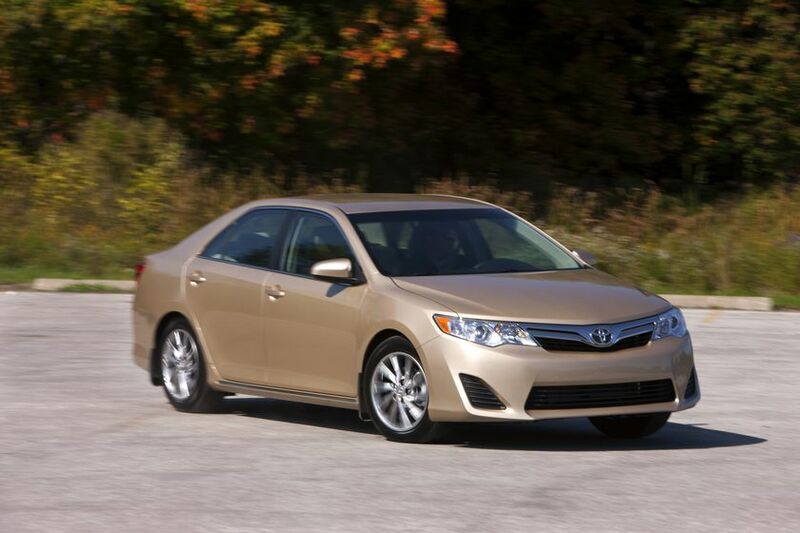 The screen also offers a new value-driven navigation system on all models except the Camry LE base package. 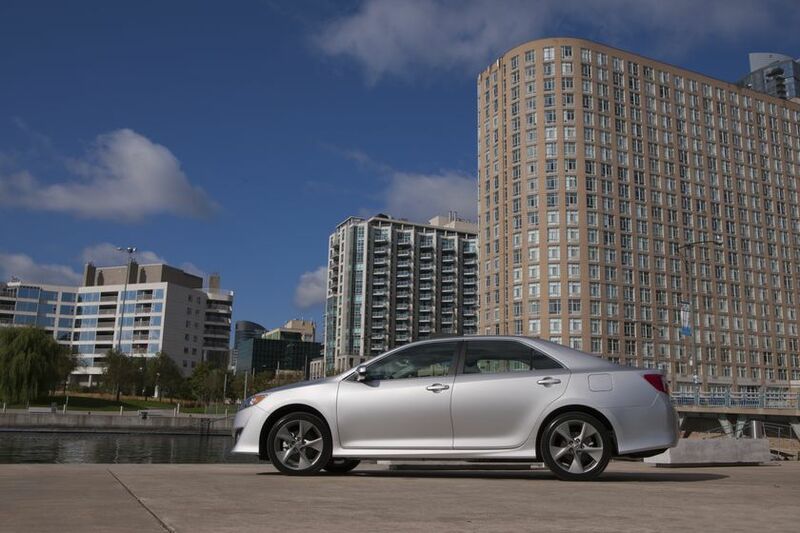 Long lauded as a benchmark for ride smoothness and quietness in the intermediate segment, the new Camry resets the standard by taking both attributes to an even higher level of refinement. To reduce noise throughout the entire cabin, focus was placed on suppressing noises that stand out. 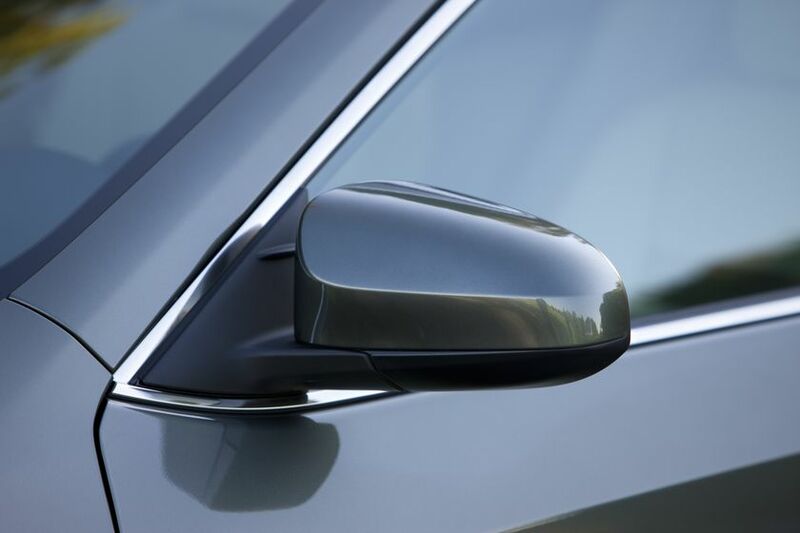 As powertrains have become more refined and quieter, wind noise and road noise have tended to become more noticeable to drivers and passengers. A low noise reading (in decibels) does not always equate to a subjectively quiet interior. Vehicle occupants’ perception of quietness also depends on the type and frequency of the sound. A dash outer silencer uses an air layer between the dash panel and sound absorbing felt. An inner silencing layer uses soft and hard felts to block a wide range of low-to-high frequencies. Damping-coating thickness and application areas have been optimized for reduced floor-panel vibration and noise penetration through the floor. Silencer panels installed in the rear-wheel housings, and new sound-absorbing materials added to the trunk’s interior side trim further reduce road noise from the tires and wheel housings. 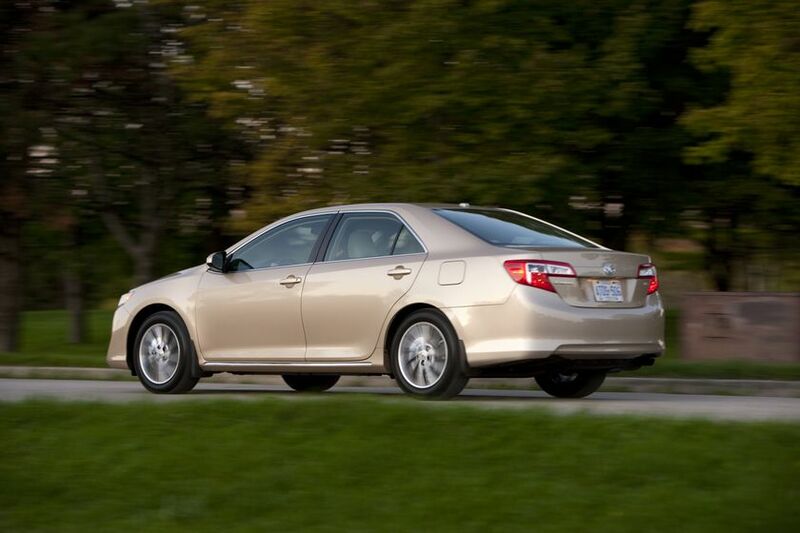 The 2012 Camry body structure uses a greater amount of high tensile steel than before and even stronger high tensile strength sheet steel, resulting in a stronger but lighter body than the previous model. 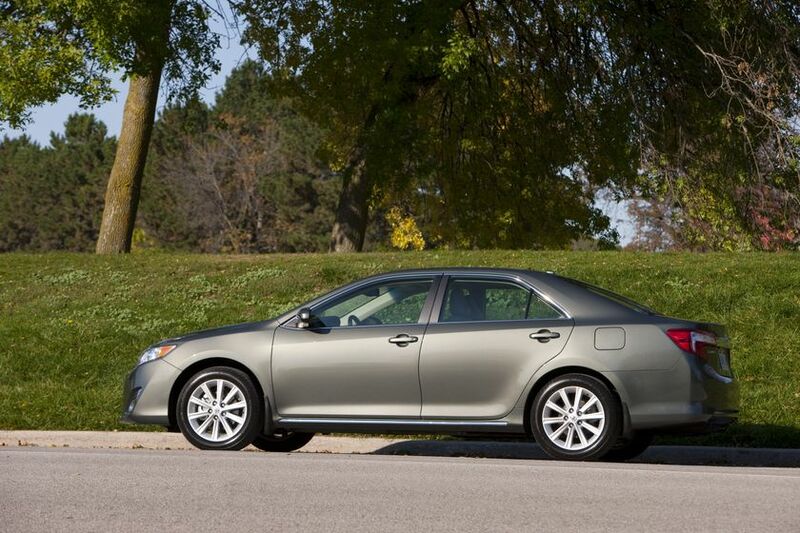 A flared design on the doors and fenders enables use of slimmer but stronger construction. High tensile aluminum bumper supports are lighter yet stronger than before. Newly developed plastic for the bumper covers and cowl louvers reduces weight as well. 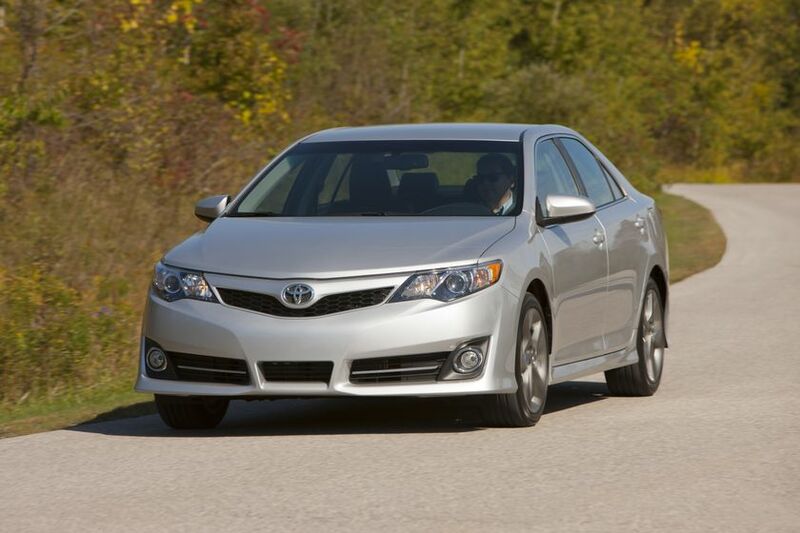 The Camry SE model features specific suspension components and tuning, including exclusive steering knuckles and lighter, stiffer lower front control arms. The front and rear springs are exclusive to this model, and the shock absorbers feature internal rebound springs for greater cornering roll resistance. 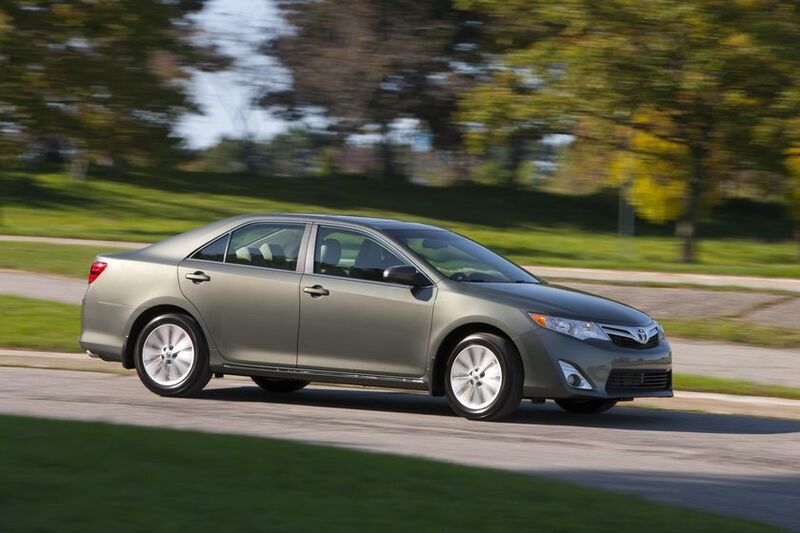 All new Camry models will be the first to feature Toyota’s latest electric power steering (EPS) control system, which will offer more flexibility to steering-feel tuning. The system regulates power-assist response based on vehicle speed, and for the first time steering-input rate. The vehicle-speed sensing feature will provide light effort during low speeds, changing to moderate effort during higher speeds. 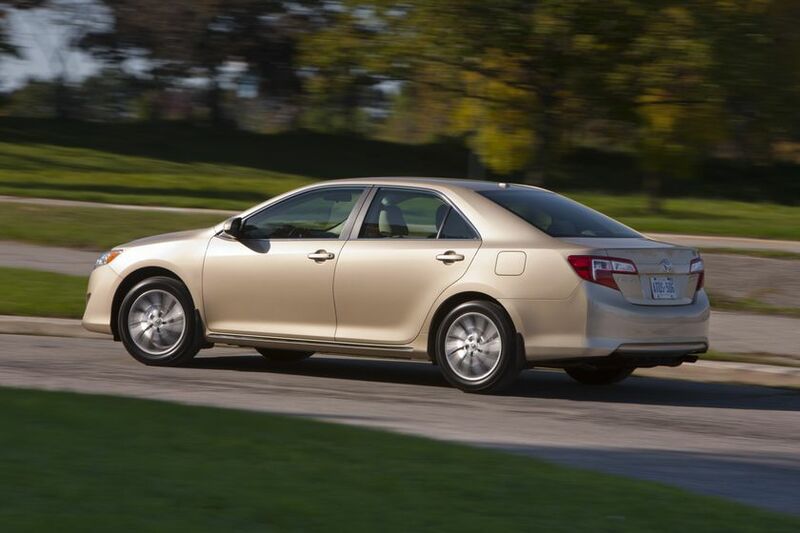 The SE grade will feature a power-assist ratio that provides a more sporty feeling than the LE and XLE. 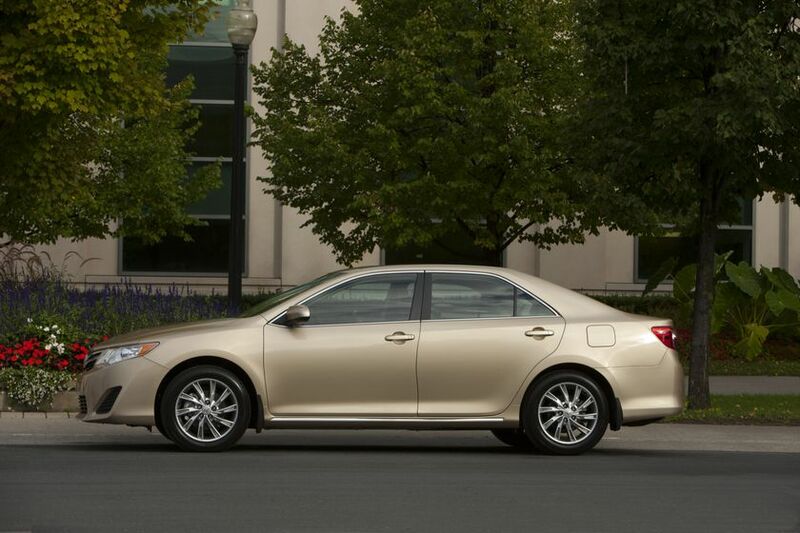 All Camry grades feature newly developed all-season tires designed for an optimal balance of fuel economy, handling, quietness, ride comfort and braking performance. 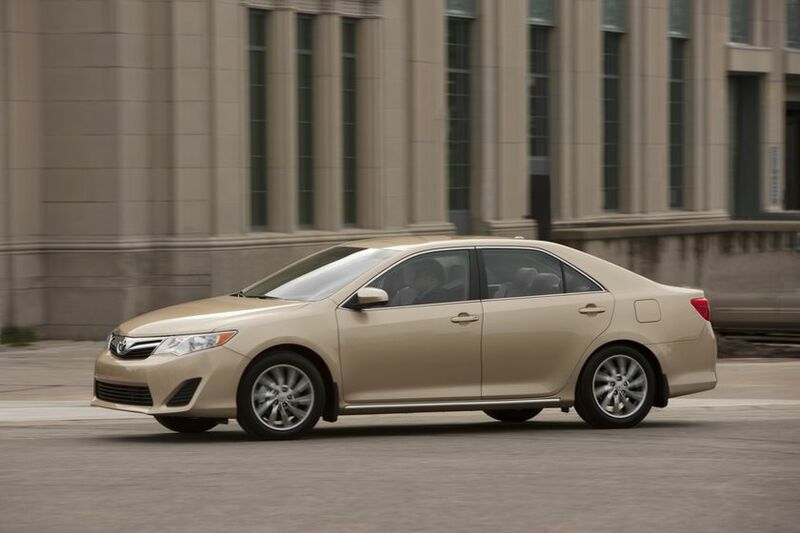 The LE grade features standard 16-inch wheels and all SE models offer the first 18-inch alloy wheels on a Camry. 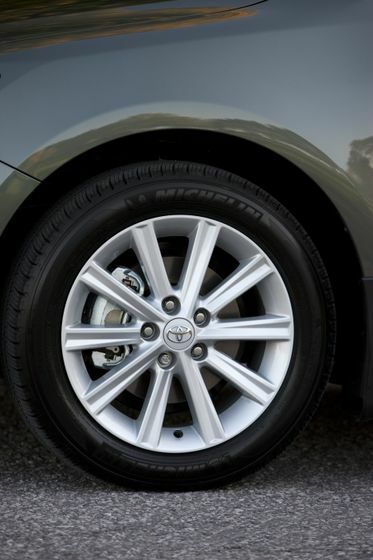 The latter feature is a unique twist-spoke design with 225/45R18 all-season tires. 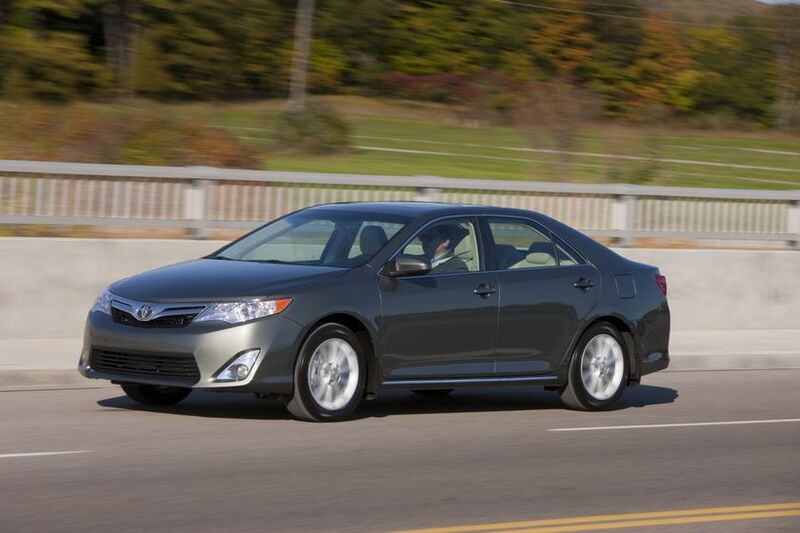 Camry SE models will also include tires that have more grip. 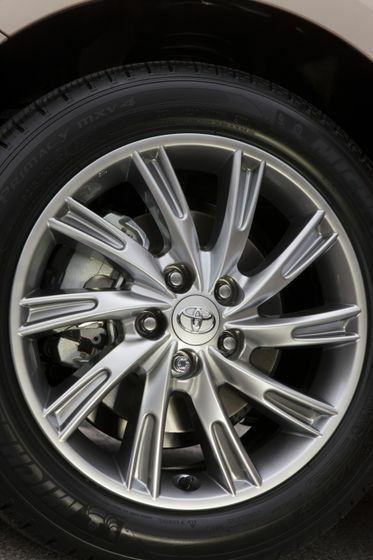 The Camry XLE comes standard with 17-inch alloy wheels featuring an elegant 10-spoke design. 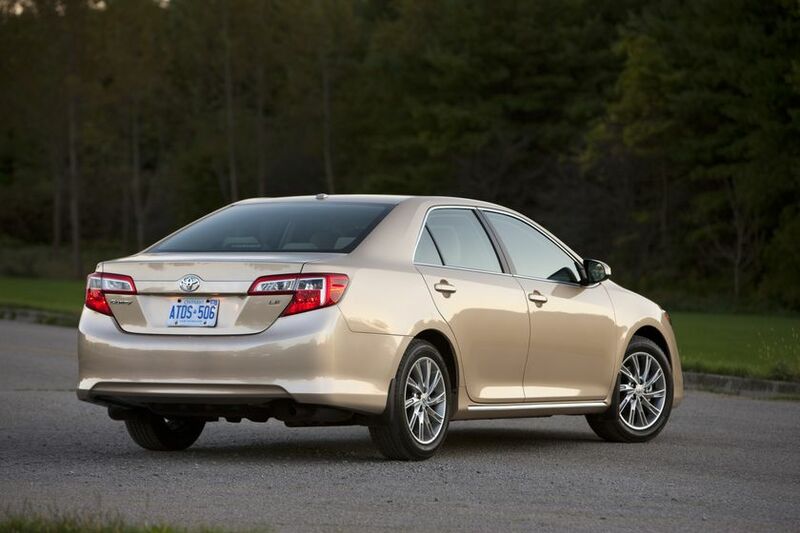 The new 2012 Camry arrived at Toyota Dealers across Canada in October, with the suggested retail prices starting at $23,700, which is $1,610 less than the equivalent 2011 models while offering $889 in additional standard equipment. 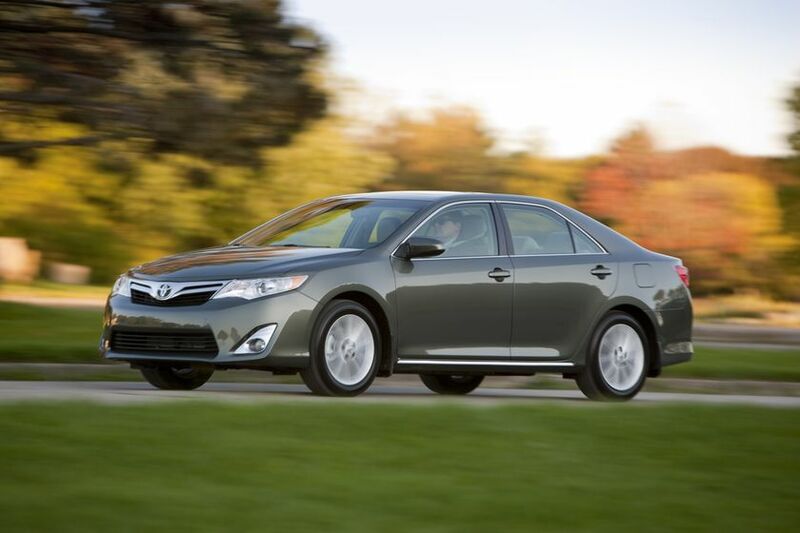 The Camry SE starts at a suggested $26,950 for the four-cylinder model, and $29,900 for the V6, that is $805 less for the SE four-cylinder and $4,355 less for the V6. 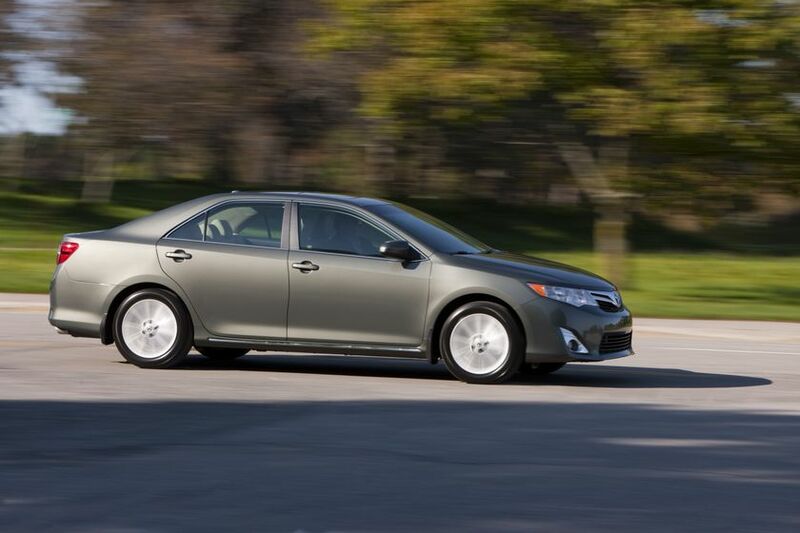 The Camry XLE starts at a suggested MSRP of $29,900 for the four-cylinder model, and $33,700 for the V6, which is $2,335 less for the four-cylinder and $2,710 less for the V6. 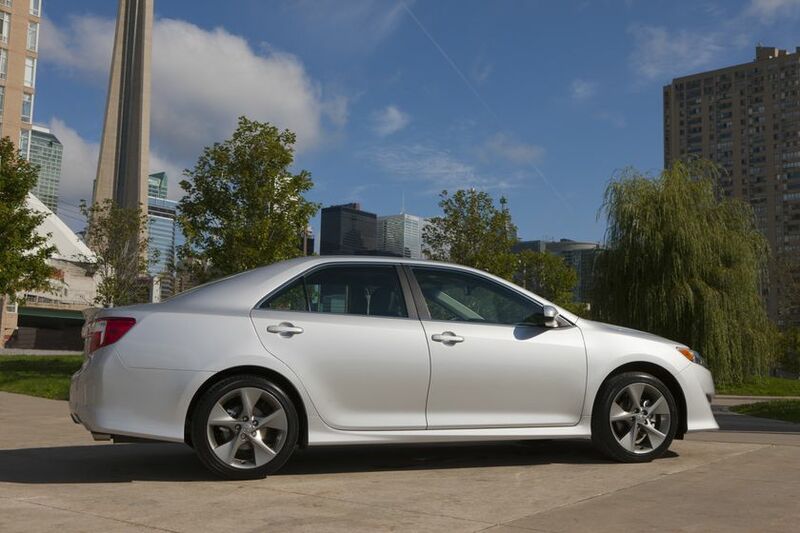 The new 2012 Camry Hybrid arrives at Toyota Dealers across Canada in November, and also carries suggested retail prices below equivalent 2011 models. 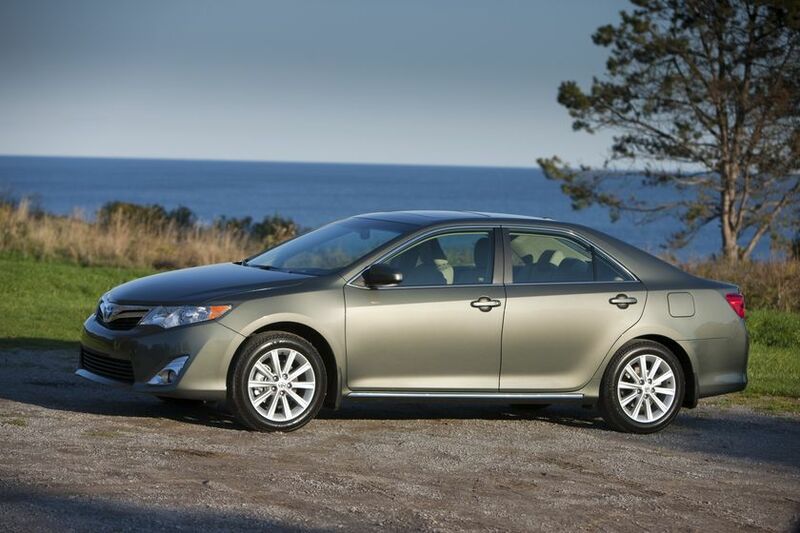 The 2012 Camry Hybrid LE starts at a suggested $26,990, while the 2012 Camry Hybrid XLE starts at a suggested $28,990, which is $2,320 less than the 2011 equivalent, while offering $745 in additional standard equipment.